It is unknown whether tyrosine kinase inhibitors targeting epidermal growth factor receptor (EGFR) can be discontinued in patients in whom EGFR-mutated lung cancer has well stabilised. We present a case of a 73-year-old Japanese woman with no history of smoking. Right pulmonary lower lobectomy, lymph node dissection and segmental resection of the right middle lobe were performed. Additionally, she underwent adjuvant chemotherapy for stage IIIB adenocarcinoma harbouring an EGFR exon 19 deletion. 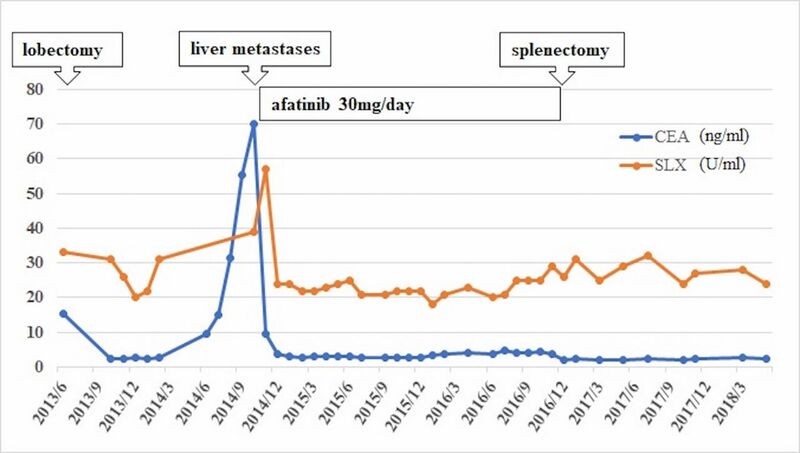 Afatinib was administered for liver metastases after 15 months. A complete response of metastatic disease was achieved for 2 years. However, afatinib was unavoidably discontinued due to splenectomy for the treatment of idiopathic thrombocytopenic purpura. Although afatinib was not resumed, due to the abscess formation as surgery complication, a drug-free complete response was sustained for over 18 months. The present case suggests that exceptional and durable responses to afatinib can be achieved in individual cases. Non-small cell lung cancer with epidermal growth factor receptor (EGFR) mutations is extremely, sometimes exceptional, sensitive to EGFR-specific tyrosine kinase inhibitors (TKI) such as afatinib.1 2 Afatinib provides long-lasting blockade of aberrant signalling of the ErbB family receptors (EGFR/ErbB1, HER2/ErbB2, ErbB3 and ErbB4).3 4 Afatinib has demonstrated superior progression‐free survival compared with cisplatin-based chemotherapy, and significantly improved overall survival in patients with EGFR exon 19 deletions.5 The 24-month progression-free survival rate reached 18%,2 and some cases of long-term complete responses have been reported.6–9 However, it is not known whether EGFR-TKIs can be stopped in patients in whom disease is well stabilised. Here, we report a case of a long-lasting response to afatinib that persisted after treatment discontinuation in a case of EGFR-mutated lung adenocarcinoma. In May 2013, a 73-year-old Japanese woman who had never smoked was referred to our hospital because of high levels of serum carcinoembryonic antigen (CEA). Her Eastern Cooperative Oncology Group performance status was 0. CT showed a 41 mm mass in the right lower lobe and a nodule in the right middle lobe (figure 1). Bronchoscopy was performed on the lung mass, but a diagnosis could not be made. In July 2013, the patient underwent video-assisted thoracoscopic right pulmonary lower lobectomy, lymph node dissection and segmental resection of the right middle lobe. The pathological diagnosis was a pT4N2M0 stage IIIB adenocarcinoma with EGFR exon 19 deletion (figure 2). The patient underwent four cycles of adjuvant chemotherapy with cisplatin and vinorelbine. In February 2014, the patient developed ecchymoses on the limbs and bloody sputum, and her serum platelet count decreased to 5x109/L. She was diagnosed with idiopathic thrombocytopenic purpura (ITP) by a haematologist and received oral prednisolone (30 mg daily). In October 2014, her serum CEA level increased to 55.2 ng/mL, and CT and ultrasonography revealed metastases in segments 1 and 2 of the liver (figure 3A,B). Chest tomography at the first visit showed a 41 mm mass in the right lower lobe (A, B) and a nodule in the right middle lobe (C, D; arrowhead). 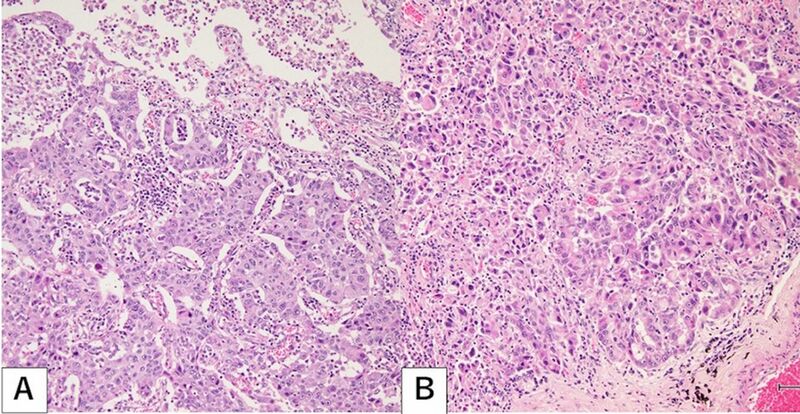 Histological findings of the lung specimen taken from (A) the right lower lobe and (B) the right middle lobe showed solid predominant adenocarcinoma with mucin production (H&E, 40X magnification). 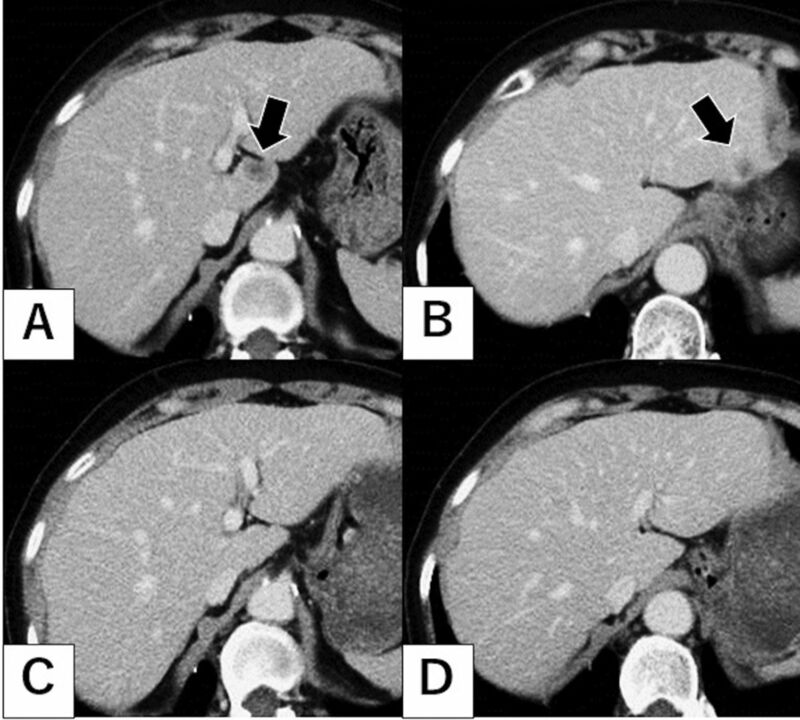 Chest tomography in October 2014 showed multiple liver metastases in segments 1 and 2 of the liver (A, B; closed arrow), which had disappeared by April 2015 (C, D). Due to her EGFR mutation status, the patient was treated with afatinib (30 mg once daily). After 5 months, a CT scan and ultrasonography revealed that the liver metastases had disappeared, and her serum CEA level had decreased from 69.9 to 2.6 ng/mL (figure 3C,D). Afatinib therapy was ceased after 2 years, when the patient underwent a splenectomy for ITP with severe thrombopenia. Afatinib was unavoidably discontinued before surgery because suppression of wild-type EGFR may delay epithelial wound healing after surgery. After surgery, the patient developed an intra-abdominal abscess, and antibiotic treatment with percutaneous drainage was required for 3 months. Fortunately, no evidence of disease recurrence was evident on follow-up CT and ultrasonography. Therefore, afatinib therapy was not resumed. Ultimately, a sustained, complete response was achieved and maintained during the treatment for the abscess. At present, the patient is still being followed, with afatinib treatment having been discontinued for more than 18 months (figure 4). Clinical course as assessed by tumour markers. CEA, carcinoembryonic antigen; SLX, Sialyl Lewisx-i antigen. There have been only a few reports of cases of complete responses that are maintained over the long term with EGFR-TKI discontinuation. 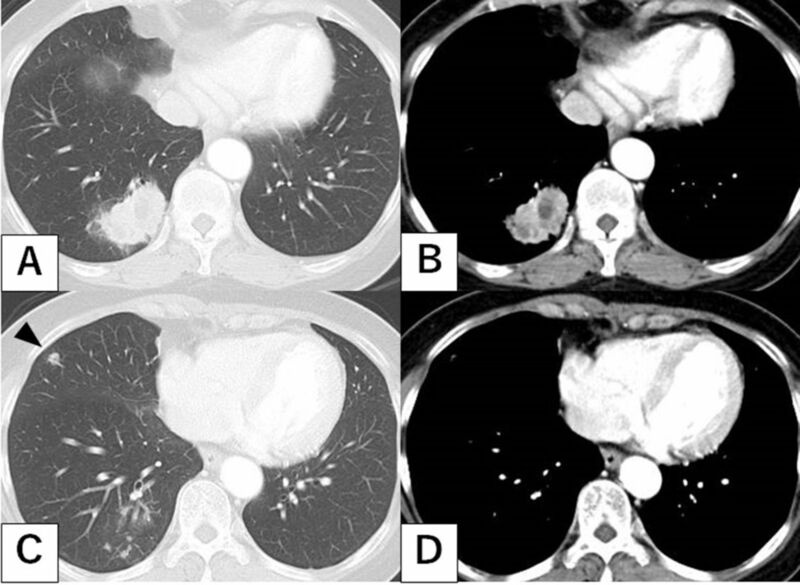 This is a rare case, to the best of our knowledge, of an EGFR-mutated lung adenocarcinoma achieving a long-lasting response to afatinib that persisted after treatment discontinuation. Two issues are of particular significance in the present case report: (1) the drastic complete response to afatinib, and (2) the long-lasting response that persisted after treatment discontinuation. First, the exceptional response in the present case might be due to the low intratumour heterogeneity and the low mutational burden, except for the EGFR mutation. Although the objective response rate to EGFR-TKIs is approximately 60%, only a few cases achieve a complete response.10 Smoking is associated with increased mutational burden due to misreplication of DNA caused by tobacco carcinogens.11 The genetic variability and intratumour heterogeneity of lung cancer complicate its treatment. The effect of tumour heterogeneity on the response to EGFR-TKIs has been confirmed by several studies.12 13 In the present case, it is thought that the liver metastases were relatively homogeneous masses of cells responding to EGFR-TKIs. In chronic myelogenous leukaemia (CML), in which the BCR-ABL oncogene acts as a driver mutation, it has been suggested that patients might be able to discontinue treatment with the TKI imatinib after achieving a deep molecular response.17 In the Japan Adult Leukemia Study Group-STIM213 study, 3-year treatment-free survival was 64.6% in patients who sustained a deep molecular response for at least 2 years, and all patients who lost a major molecular response regained it by retreatment with imatinib.18 Furthermore, there have been a few reported cases in which a complete response was maintained after discontinuation of an EGFR-TKI, as in this case.19 20 The present case suggests that EGFR-TKI treatment could be ceased, like imatinib, in specific individual cases. However, identifying predictive factors for successful discontinuation of EGFR-TKIs is a problem. In CML, patients who had achieved a deep molecular response were selected for imatinib discontinuation. Similarly, a molecular response may become the criterion for the discontinuation of EGFR-TKIs. The use of cell-free DNA (cfDNA) to monitor cancer burden is a growing area of research.21–23 Further development of high-sensitivity tests for cfDNA is warranted to monitor the response to EGFR-TKI discontinuation. In addition, one of the factors for successful discontinuation of afatinib in the present case could have been the underlying autoimmune disorder. Regulatory T cells (Tregs) are a dominant mechanism of tumour immune escape, and CD4(+)CD25(+) Tregs depletion improves endogenous antitumour immune responses.24–26 On the other hand, naturally occurring CD4(+)CD25(+) Tregs are both functionally impaired and lower in number in patients with ITP.27 Thus, ITP effects on Tregs may increase antitumour immunity and contribute to the maintenance of a complete response. Further research will be required to determine how changes in Tregs in autoimmune disease including ITP improve antitumour immunity. The present report suggests that some cases that have achieved durable responses to afatinib might be able to discontinue EGFR-TKI treatment. High-sensitivity methods to monitor residual disease will allow physicians to optimise therapy, including adjustment of the treatment period and the EGFR-TKI dose. Exceptional responders to afatinib might be able to discontinue epidermal growth factor receptor-tyrosine kinase inhibitor (EGFR-TKI) treatment, although additional research is required. The response to afatinib might be long-lasting after treatment interruption because afatinib irreversibly blocks ErbB family receptors. The development of high-sensitivity analysis of residual disease will help optimise therapy, including adjustment of the treatment period and the EGFR-TKI dose.
. Antitumor effect and potentiation of cytotoxic drugs activity in human cancer cells by ZD-1839 (Iressa), an epidermal growth factor receptor-selective tyrosine kinase inhibitor. Clin Cancer Res 2000;6:2053–63.
. [Long-term survival with complete response by gefitinib treatment followed by noncurative operation for lung cancer]. Kyobu Geka 2014;67:375–8.
. Targeting regulatory T cells. Int J Cancer 2010;127:759–67.
. Regulatory T cells in tumor immunity. Target Oncol 2012;7:15–28. Contributors YY created a large part of the article. YS designed this report, supervised the draft of the manuscript and assisted in the preparation of the manuscript. TI and KK proofread the article.